Read the most important Node.js news & updates from this week: Migrating from Java to Node, Extending Slack with Node.js, IoT and Node, Top 10 of 2016, Unit-testing cheat sheet. In September 2015, Romans Bermans have joined a 2 months old startup which had a team of 4, enough funding to get going for a year and a challenging vision for the future. In 15 months we went from a prototype of our platform through a Java, Spring, MySQL stack deployed on AWS to a total rewrite in Node.js, Restify, Firebase deployed on GCP. It is 2016 and Slack is the new e-mail. For many distributed teams or companies like Auth0, Slack has become the default communication solution. In this post I will show how you can easily extend Slack with Node.js using Slash Webtasks, a solution we have created at Auth0 that builds on the serverless concepts. Using this approach you can automate processes, run your devops, generate reports, and more, in a powerful yet simple and efficient way. and many more.. Read the full article for the details. Tod Kurt knows a thing or two about IoT devices. As the creator of blink(1), he’s shipped over 30,000 units that are now out in the wild and in use for custom signaling on everything from compile status to those emotionally important social media indicators. Tods' talk at the 2016 Hackaday SuperConference covers the last mile that bridges your Internet of Things devices with its intended use. This is where IoT actually happens, and of course where it usually goes astray. buffer.fill() now works properly for the UCS2 encoding on Big-Endian machines. disconnect() now returns a reference to the disconnected worker. The built-in list of Well-Known CAs (Certificate Authorities) can now be extended via a NODE_EXTRA_CA_CERTS environment variable. Remove stale timeout listeners in order to prevent a memory leak when using keep alive. Including base argument in URL.originFor() to meet specification compliance. Improve URLSearchParams to meet specification compliance. 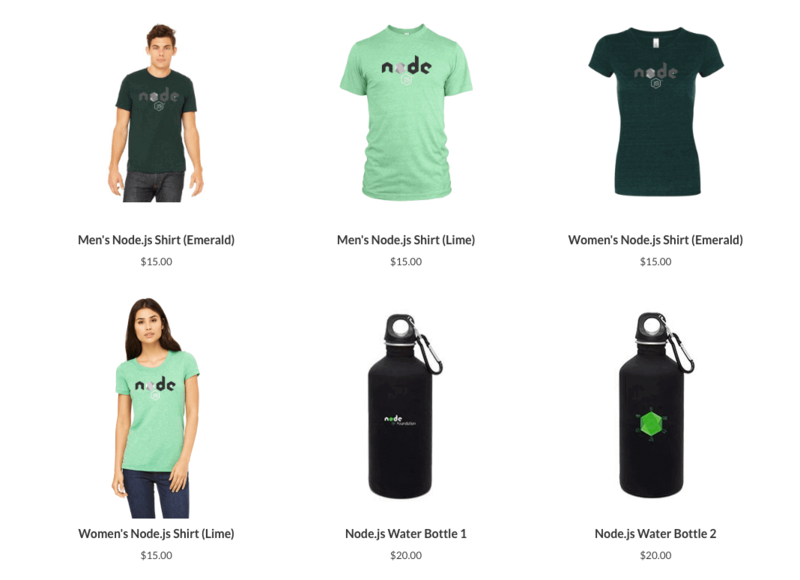 The Node.js Community Store got opened this week, allowing you to order Node themed t-shirts, stickers and water bottles. Using mocha/chai/sinon for node.js unit-tests? This list got you covered!